If you are a landowner planning to sell logs to a lumber mill, you need to have a good idea of the logs' value. Lumber mills pay according to the number of board feet, or board footage, in the logs. One board foot is equal to the amount of wood in a one-inch-thick board that measures 1-foot by 1-foot. Board footage is calculated based on a log's diameter and length. You should check with your local sawmill to find out specific guidelines for determining board feet before you enter into a final contract. A mill pays for a log based on the estimate of lumber board feet it contains. Obtain a scaling stick of the type used in your region. A scaling stick is like a yardstick, but it has printing that shows the number of board feet in logs at different diameter and length combinations. 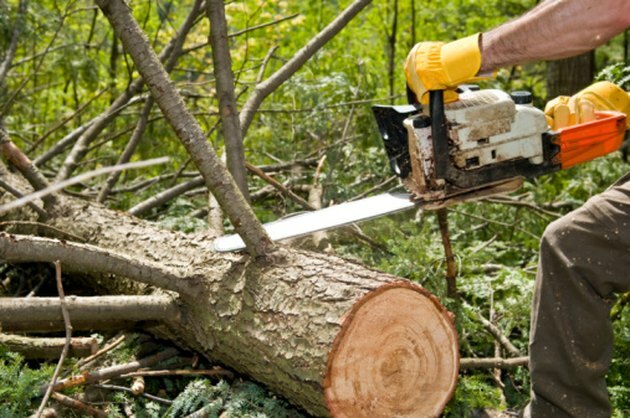 Different regions use different conversion factors, so check with the sawmill where you plan to sell the log to see what type of system it uses. Measure the length of the log in feet. Round down to the nearest full foot. Many sawmills require you to round down to the nearest even foot, especially for softwoods. For example, a log that is 11 feet, 6 inches would be rounded down to 10 feet. Measure the diameter of the wood at the smaller end of the log to the nearest inch. Do not include the bark in the measurement. If the log end is oval-shaped, take two measurements at right angles and use the average of the two measurements as the diameter. Use the scaling stick to find the board footage. For example, if the log has an 18-inch diameter, several board footage amounts based of different log lengths will be listed 18 inches from the end of the stick. Use the board footage that corresponds to the length of the log. Make deductions for any defects in the log, such as squirrel holes, burn scars and crooks in the log. Check with the sawmill to see how these deformities factor into price calculations.